What you see here is exactly what you get: contemporary choral music from across the world – New Zealand, Estonia, the United States, Latvia, Norway (sort-of), Sweden, and Australia. The choir Canticum itself is new to me although it has been in existence for 21 years; in fact, this CD is a 21st birthday celebration. 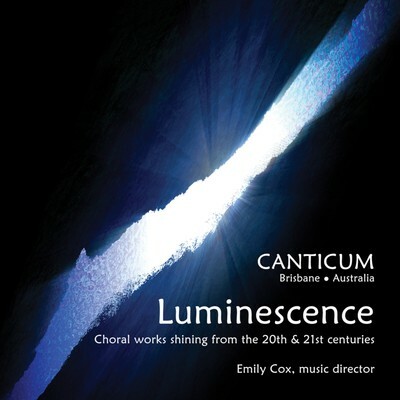 With founding conductor Emily Cox, the ensemble is currently in residence at St. Mary’s Anglican Church, Kangaroo Point in Brisbane and, on this showing, is a more-than-able body, even if some of the tracks on offer in Luminescence could have profited by a re-take. Cox and her cohorts adopted the over-arching theme of light; in this instance, light generated by sources that need no heat to do their work. This refers, I suppose, to the static nature of scores which, in themselves, have no physical energy. Canticum’s task is to generate the luminous – sometimes, the numinous – by their efforts and, for a good deal of the time, this works. Of the 16 tracks, three contain settings of the Maundy Thursday antiphon Ubi caritas, seven comprise the Magnificat-Antiphons of Arvo Part, another is New Zealander David Hamilton’s version of the Ecce beatam lucem text best known for its 40-part setting by Alessandro Striggio, and Swedish composer Fredrik Sixten uses the chant Veni, veni Emmanuel in his refugee-remembering The Fleeing Child is Jesus to a text by Norwegian poet Emil Skartveit. The remaining six works fall under the general heading of celebrations of nature, or even God-in-nature. You can find much interest in the Ubi caritas settings which are treated handsomely by the Canticum singers, beginning with a version of that by Ola Gjeilo which owes most to the original Gregorian as well as the luminous Durufle arrangement; not many surprises in the work itself but the choir gives it a refined and fluent reading. Paul Mealor’s treatment was used at the wedding of Prince William and Kate Middleton; in my case, its inclusion in that ceremony went through to the keeper. Which was a pity because its quiet abrasiveness, well-husbanded dissonant moments in the work’s progress, display an unexpected individuality of voice. Cox gives prominence to the motet’s inner parts at tense moments, which makes for some remarkable harmonic exposure, but Mealor succumbs to the temptation of citing the original chant en clair towards the end. Australian-born Joseph Twist’s treatment is slow-paced and meditative in a post-Tavener style, with moments of stasis on certain syllables – Ubi caritas et amor or congregavit. The verses starting with Exultemus move into a more rhythmically dynamic region; even so, the singers could have attacked these pages with more ferocity. Like the other settings, Twist’s is ternary in form and not over-adventurous harmonically, although the stretch of bitonality near the end made a pleasant surprise; a pity, then, that the work concluded so predictably. Part’s versions of the O Antiphons – those appearing in the Vespers services of the days leading up to Christmas Eve – are generally terse, even when he seems to be mulling over the texts. The first, O Weisheit, is vintage Part with an orthodox texture changing at glacial pace; O Adonai seems to be for male voices only and the Canticum basses sound laudably confident; O Spross aus Isais Wurzel tests the choir’s ability at sustaining grating 2nd intervals. In O Schlussel Davids, the body’s sopranos sound marginally ‘off’ their top notes and their line doesn’t regain its certainty until the concluding die Fessel des Todes bars. O Morgenstern finds them in better form, although the final statement of the title could have been re-recorded with profit. O Konig aller Volker satisfies for its firm treatment of Part’s underpinning tramping pace, while the concluding O Immanuel also suffers from top-line pitching, the series of top As not quite centred accurately; Part’s second-time through this text fares more successfully, but then, it’s less challenging. Hamilton’s Ecce beatam lucem is written for SSAATTBB forces and its opening is a powerful and brave acclamation that more than adequately sets up a luminous choral ambience. Parts of the Canticum’s aggressive approach work very well but there are some lapses; the composer’s clever build-up of tension at the final line, Nos hinc attrahunt recta in paradisum, needs more deliberate definition and disciplined order of attack. Like Part, Hamilton exposes his sopranos on top of low-lying textures, with the result that they sound strident on occasion, hard-pressed to do anything but get the note(s?) required. The piece is testing of all executants but this group might be better advised to take the whole thing at a more rapid tempo – like the Kiwis do. Sixten’s score enjoys an excellent performance here, the singers maintaining a clarity of shape and texture even when the composer puts the Gregorian line in operation simultaneous with his own setting of Startveit’s words. The point is made without being laboured – Christ was a refugee and his status is reflected in the modern-day influx to Europe (and Australia) from the East and Africa. Sixten is humane enough to celebrate the optimistic Gaude elements of the chant alongside the poet’s ringing appeal for the worth of charity: Open the door for suffering. If not the high-point of the CD, this comes close to it with an appealing clarity and enthusiasm from its performers. Cox and her choir juxtapose samples from the work of two formidable American composers. First is Sure on this shining night, Morten Lauridsen’s interpretation for four-part choir with piano accompaniment of James Agee’s well-known poem, You’d have to work pretty hard to miss with this splendid composition and the Canticum give a carefully honed version with a fine timbral glow; this might not be as dramatic at its climax as many American choirs make it, but I much prefer this body’s sustained communication of hushed wonder and Delius-like shimmer in the movement of lines. Randall Thompson’s Choose Something Like a Star sets an early poem by Robert Frost and, like Lauridsen’s piece, asks for SATB choir with piano. I’ve never understood its popularity, least of all for its leaden-footed pace at the start and the regularity of its syllabic heft. Still, the group treats it with care, showing no trouble in handling its few tests and giving some body to pretty predictable sequences. Thompson’s vocabulary sets no challenges for the listener but the poet’s approval of the composer’s treatment of his lines seems to veer towards the charitable. I had the feeling that Christopher Wrench’s accompaniment was leading the voices – or rather, anticipating them – at various stages, although that could just have been enthusiasm or an understandable urge to keep the pace moving. Stars by Eriks Esenvalds asks the singers to handle tuned glasses and Tibetan bowls; the few performances I’ve seen have been lacking in the bowls area and only some of the choir members have been trusted to manufacture that eerie, science-fiction-suggestive sound from the glasses part-filled with water. Some of the pitching here left me unconvinced, notably at Sara Teasdale’s line Up the dome of heaven, and the soprano solo before the climactic stanza beginning And I know that I is inexact. Brisbane composer Phillip Gearing employs sustained chords under a gently lyrical line to set the mood for his Only the Light which uses a text fragment from Surrealist-feminist Leonora Carrington’s short story The Royal Summons. This is in effect a slow-moving nocturne, highly atmospheric and pretty successfully achieved, although there seems to be some out-of-sync harmonic movement from the tenors during the work’s final clause. Giselle Wyers has set Roethke’s famous poem The Waking; but has she? The text that we hear is the American poet’s I strolled across An open field that comes from Roethke’s The Lost Son and Other Poems of 1948, some years before he wrote that striking villanelle, I wake to sleep, and take my waking slow. This composer also has a piano accompaniment but the work itself, lilting and benign, tends to aimless modulation – an ordinary-sounding idyll. The CD ends with a piece written for Canticum by Keren Terpstra, who supplied both music and words. Light refers to the Transfiguration, albeit elliptically in its two cryptic lines. While the working-out becomes a tad ordinary at the start to the work’s second line, the composer struck gold later with her use of sonorous chord clusters in which the inner lines move downward in writing of no little complexity, testing polyphony in which the Canticum singers hold their nerve; a pity that this challenging piece ends rather tamely in a G Major resolution. In sum, Cox and Canticum have given us an interesting miscellany including some pieces that are pretty familiar to those who have an interest in the field of contemporary choral composition and some rarities, even for the well-informed. A more demanding editorial hand would have ironed out some problem points but the disc has considerable merit, not least for shedding light on some highly deserving writers.